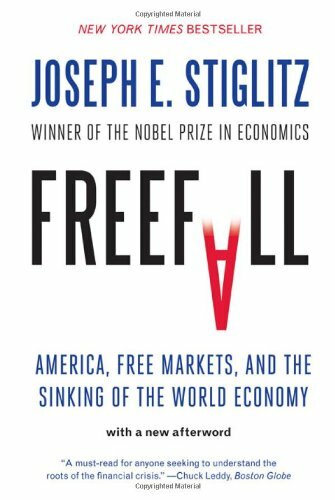 Freefall: America, Free Markets, and the Sinking of the World Economy, by Joseph E. Stiglitz. W. W. Norton & Company 2010. Nobel Prize winner Joseph E. Stiglitz explains the current financial crisis—and the coming global economic order. The current global financial crisis carries a “made-in-America” label. In this forthright and incisive book, Nobel Laureate Joseph E. Stiglitz explains how America exported bad economics, bad policies, and bad behavior to the rest of the world, only to cobble together a haphazard and ineffective response when the markets finally seized up. Drawing on his academic expertise, his years spent shaping policy in the Clinton administration and at the World Bank, and his more recent role as head of a UN commission charged with reforming the global financial system, Stiglitz outlines a way forward building on ideas that he has championed his entire career: restoring the balance between markets and government, addressing the inequalities of the global financial system, and demanding more good ideas (and less ideology) from economists. Freefall is an instant classic, combining an enthralling whodunit account of the current crisis with a bracing discussion of the broader economic issues at stake. . Winner of the 2001 Nobel Memorial Prize for Economics, Joseph E. Stiglitz is the author of Making Globalization Work; Globalization and Its Discontents; and, with Linda Bilmes, The Three Trillion Dollar War. He was chairman of President Clinton’s Council of Economic Advisers and served as senior vice president and chief economist at the World Bank. He teaches at Columbia University and lives in New York City.